Mobilization To Double Food Production Is In Full Swing! The article entitled ‘Walking Dead’ WTO Is Ruining World's Agriculture Producers tells of the G-21 underdeveloped countries who are understandably sick of being at the beck and call of the so-called industrial nations. But their demands reveal blindness to the fact that the farmers of the developed countries are victims of the very same machinations by the food cartels, as the farmers in the poorest countries. A solution? A worldwide parity price for food production. Henry Kissinger and NSSM 200- Genocidal Plan to Reduce Thirld World Population! Lyndon LaRouche, economist, statesman and Democratic Party Presidential pre-candidate, is calling on President Bush and other world leaders to conduct an immediate food relief effort into North Korea, with absolutely no political strings attached. 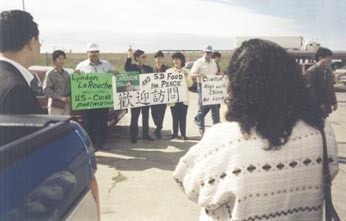 The food aid is urgent to avoid a devastating famine, and, in LaRouche's plan, would serve as a prelude to discussions between the United States, North Korea, and other interested parties, concerning all of the unresolved bilateral and multilateral issues currently on the diplomatic table. LaRouche declared that the food assistance program should constitute a preemptive action, to avert an otherwise severe famine, and that it must be clear that this is an unconditional humanitarian intervention. Nevertheless, LaRouche emphasized that such an action, on the part of the Bush Administration and others, would serve as a useful foundation for opening productive discussions on other issues.